Chuseok gets a local twist on Jeju island.Jeju’s Beolcho (cleaning of the family grave) break, a rarest kind of holiday in the world. Chusoek is observed to celebrate the first harvest of the year on the 15th day of the 8th month of the lunar calendar. It is often referred to by many westerners as Korean Thanksgiving. The easy part to understand is that Chuseok is a celebration of the harvest and it involves a lot of cooking, eating, family gatherings and ancestral rituals. Similar to Thanksgiving, special foods are served in a festive manner for the holiday. But unlike Thanksgiving which marks the end of the growing season, in Korea, the harvest season is not yet over during Chuseok. This means that the first and most fresh flavored, abundant harvest is served to honor the ancestors. When the Chuseok holiday gets near, Korea’s tradition is that family members clean their ancestor’s graves in a ceremony known as Beolcho(벌초). 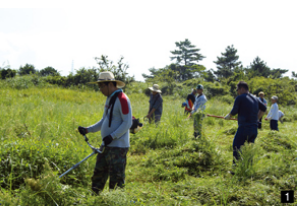 Using lawnmowers or just simple tools, family members gather to visit their ancestral grave sites, cut the grass, remove weeds, and tidy up graves. Once the work is complete, a small ritual service, offering food, drink and some alcoholic beverages are offered to the ancestors of the grave. Next, as a group, the family make two deep bows called ‘keunjeol,’ facing the graves as a way of paying their respects to their ancestors. However, this tradition faces changes and gets simpler because of smaller family sizes and an increasing aging population, which means that some families don’t have enough helping hands to continue. Because of this, it is becoming common for some families to hire what are called Beolcho service providers to do the Beolcho work. Beolcho is traditionally performed from the 1st day of eighth lunar month in the days leading up to Chuseok. This tradition is also found on the mainland, but Jeju people hold it in much higher esteem, even considering it to be a more valued ceremony than Chuseok itself, a sentiment not shared on the mainland. To the Jeju people’s mind as a Jeju’s old saying indicates, ‘ancestral rituals during Chuseok can be missed, but beolcho can’t be, whatever happens.’ There is no excuse for missing it. In particular on Jeju island all males of the clan are expected to show up and make contributions to tidying up the grave sites no matter how inconvenient or no matter where they live. Male relatives from Seoul and even from those that settled in Japan in 1930 to 1950s continue to contribute their time and efforts to join the families Beolcho work. Many point to Jeju’s strong gwendang (extended family bond) culture to explain this. If male members of the family don’t congregate, they deserve the condemnation of the family. If they repeatedly don’t, they are treated even as an outcast from the family. That’s why in the deeply-rooted culture of Jeju island, the biggest impiety, unfilial to their ancestors is not to do Beolcho work. Another thing about Beolcho in Jeju that can seem strange to some mainlanders from Korea and foreigners is that students, from elementary schools through to universities, have what is called a Beolcho Banghak, or Beolcho Break. Some say it might be a rarest kind of holiday in the world. Beolcho, cleaning of the family grave sites is deemed a living field of education for students to learn about the notion of filial piety. Institutions and private companies have the option to close for an entire day during this period to allow for employees to join in the Beolcho work. 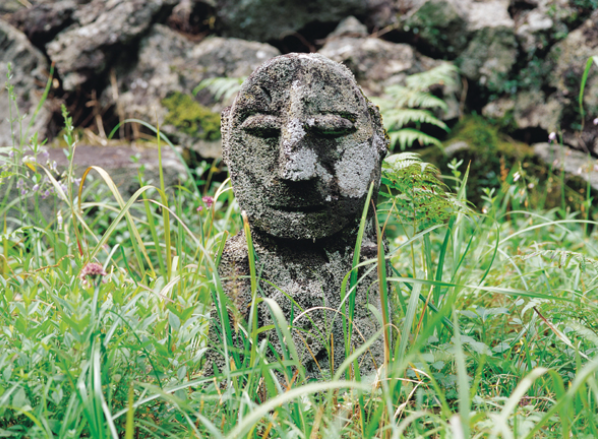 ‘In Epirus, the dead are always with the living.’ It is all the more true on Jeju island. When you drive along any road in Jeju, from a main highway to a remote country lane, one of the first things you’ll notice will likely be stone walled graves. 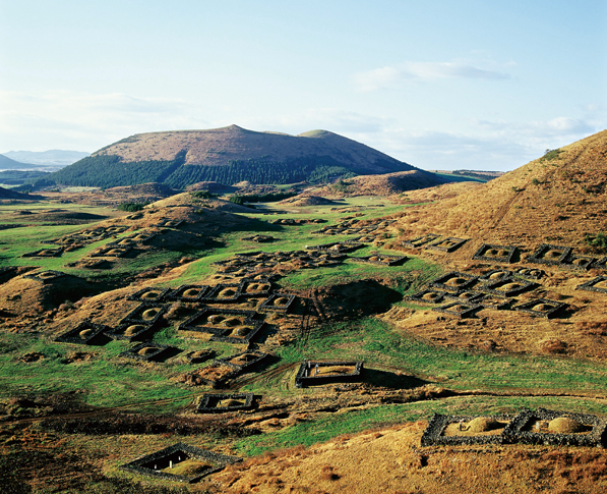 These high grave mounds surrounded by ‘sandam’ or basalt stone walls are literally everywhere on Jeju. The low, thick basalt stone wall is intended to protect from the wind and grazing animals. Ancestral gravesites are commonly placed on the family’s land, often marking property boundaries. 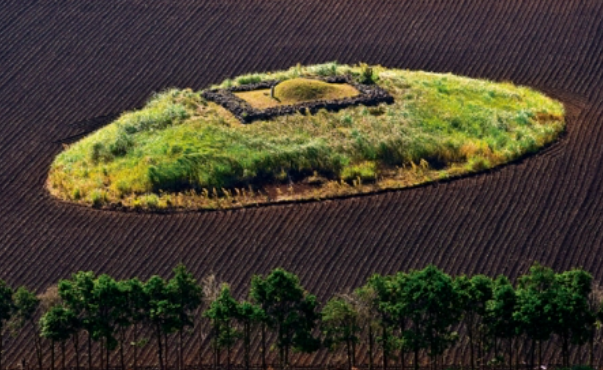 Some graves are often located on the sides or atop Jeju’s oreums or volcanic cone, providing the scattered quilt art work- like views of the landscape. While the stone walls may look impossible to breach, each one actually contains a gate, or passage, so the spirit of the deceased can freely come and go. For men, the passage is built into the left side of the grave, while for women it’s placed on the right. Gravesites also have guardians of small stone statues called ‘Donjaseok’ or child stones. The stone statues are carved from porous basalt rock, are placed inside the grave site as a spiritual companion. What will stay open and what will be closed during Chuseok?